Retouching pics has reached new levels! Oh my gosh! This whole editing and retouching your pictures has reached a new level. I saw this post on Instagram and all I could do was smile. Like for real. One thing is that magazines let Mr. Photoshop pay a visit and sprinkle his magic over the pictures before they are being published. But do we also have to do it on our own personal Instagram pictures? Like not too long ago my friend – not mentioning any names – posted a picture of us. I was in shock! Normally her and I are about the same size – I might be a little slimmer – but basically the same size. In the picture she posted of us I looked gigantic. She on the other hand had a body straight of the Victoria Secret Catwalk. 🙁 The reason why I looked so huge was as she was making her own waist smaller the picture had been stretched so much –> which meant my body also had been stretched and appeared a lot wider than normally! I really wished this trend would end already. 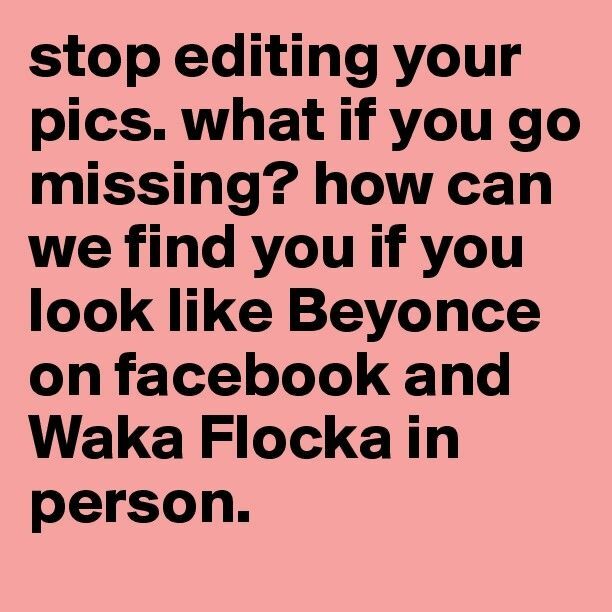 Or could we at least make a social media rule that you had to put a hashtag like #Retouched #IDontReallyLookLikeThis #Photoshop #UnretouchedGirlsDontFeelBad #MagicFilter or something to remind the rest of us that these pictures are not real life. LOL. No, but seriously. If you don’t look nothing lil your Instagram account – go ahead and delete your account already. Or just use one of the previous hashtags 😉 hahaha. In the following link they are showing how to spot a “retouched” picture. They use celebrity Instagram photos like Beyonce, Kim Kardashian, Miranda Kerr etc. to show the differences. Hvad hedder du på Instagram?